THE 1000-year Reich has spawned many 1000-page histories, but few so fascinating and controversial as this one. In Hitler's War -- called by Sir John Keegan one of the two best books ever written on WWII -- Irving gave sympathetic treatment to the Führer. In this book he gives unsympathetic treatment to the Führer's most implacable enemy. And why not? Britain is surely strong enough to withstand a few uncomfortable facts about her own history? The fundamental question which confronts the reviewer, as it confronted Mr. Justice Gray in the High Court last year, is whether Irving's unconventional views are honestly held or part of a larger political campaign. Few people dispute the depth of Irving's research. No less an authority than A.J.P. Taylor called him the best informed historian on the Nazi sources. But many doubt his sincerity, and therefore the use to which he puts that scholarship. It is not (yet) unlawful in Britain to hold unpopular views on matters of public interest which are properly researched. I say "in Britain" because in Germany this is no longer the case. Irving himself has been fined and banned from entering the country for expressing the view -- subsequently confirmed as fact -- that the gas chambers which tourists see today at Auschwitz were built in 1948 by the Polish communist government as propaganda artifacts. But, pace Mr. Justice Gray, Irving does not deny the holocaust, only some of the embellishments the story has acquired at the hands of those who want to use history as a weapon. Other countries where political correctness has taken root, including Australia and Canada, have followed Germany's illiberal example. It is perhaps significant that Israel has not done so. Irving's fundamental argument in this immensely detailed book is that Churchill was not the hero he has been cracked up to be; that he was disliked and mistrusted by many of those close to him; and, most importantly of all, that he was responsible for continuing the war after the summer of 1940 when Hitler tried to end it as conqueror of Poland and France, but not of Britain. The basis of the deal Hitler held out and which both the Foreign Secretary and the Queen wanted to accept (the latter attested by papers Irving quotes which were closed until 1999) , was "Europe for me; the Empire for you". Irving regrets the loss of Empire and blames it on Churchill. Since there is nothing so unhealthy in politics as authoritative criticism stifled, it is important to consider Irving's arguments and evidence carefully. My own view, having grown up in the shadow of Empire amongst the Scots abroad, is that Britain's imperial status in 1940 was unsustainable. With hindsight, it is hard to see that losing the Empire in the battle to make the world safe for consumerism, Cary Grant and the quarter pounder with cheese was any great catastrophe. However, 50 million people died, including 6 million Jews, and Irving is right to ask the question: was the game worth the candle? 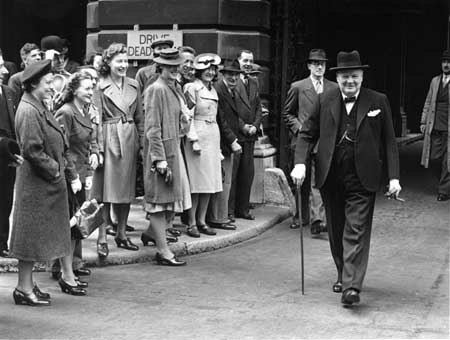 The war between Churchill and Hitler ultimately came down to this: did the British people in 1940-1 prefer to be ruled by a man whom Irving accuses of dining on oysters, champagne and roast partridge or by a vegetarian teetotaller who spent his evenings discussing tank production statistics? Were we for fun or virtue? Having long since lost whatever Calvinist soul it may once have had, Britain chose the former. But Irving, one suspects, still has a Calvinist soul. And that is why men like the appalling Mr. Justice Gray mistrust his motives. In an odd sense, Irving is the victim of his own seriousness -- how very Scottish of him. Ian Mitchell's book about the forced repatriations from Austria in 1945, The Cost of a Reputation, is published by Canongate. Mr. Justice Gray features largely in it.